Commercial and financial close with Denver Transit Partner occurred in August 2010. Substantial completion is expected to occur during 2018. 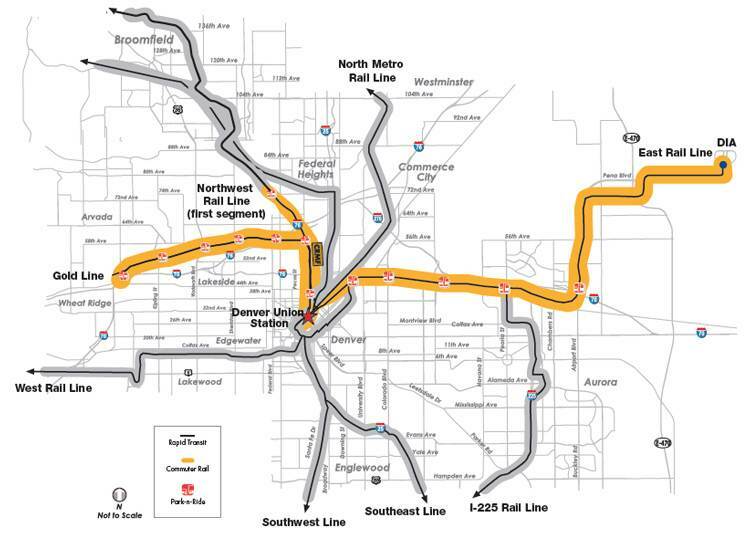 The Eagle Project is being procured through a concession agreement between RTD and Denver Transit Partners to design, build, finance, operate, and maintain the project's components for 34 years. RTD will retain ownership of all assets at all times, set fares and fare policies, and keep all project revenues. RTD will make availability payments to the concessionaire based on established performance metrics. As of September 2015, the Eagle P3 project has employed 6,900 individuals and contributed more than $1.319 billion in total economic impact. Additionally, the project nearly cuts in half the time it takes for commuters to travel from downtown Denver to Denver International Airport, according to a 2011 statement from former US DOT Secretary Ray LaHood. The use of TIFIA financing and concessionaire structuring allowed for project delivery approximately 2 years earlier than other methods would have allowed. Direct loan: $280 million. The TIFIA loan is secured by a senior lien gross revenue pledge of RTD's 0.4 percent sales tax revenues and a subordinate lien pledge of RTD's 0.6 percent sales tax revenues. The TIFIA credit agreement was executed in December 2011. RTD was awarded a $1.030 billion Full Funding Grant Agreement (FFGA) on August 31, 2011. Interest payments are set to begin in 2021 and principal payments are set to start in 2025; final loan maturity is expected to occur in 2045.